If you’re like Drago you love frosty mornings and snow. Drago thinks frosty mornings are great as he can wrap up really warm and the frost makes the trees and spider webs look really pretty. But like Drago you might not like getting out of your nice warm bed on the cold, dark winter mornings. Drago really likes going to school but he would much rather stay snuggled up in his bed. Mummy Dragon has to wake him up otherwise he would stay there all day. 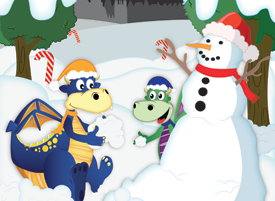 When it snows Drago and Flash love to build snowmen and make snow dragons. The have even had snowball fights, last time they hit Daddy Dragon with a snowball by mistake. He wasn’t a happy Dragon. Drago loves to warm up when he has been outside on a cold winter’s day with tea and toast. Drago’s family have a log fire so he has to be extra careful when it is lit. He makes sure he doesn’t get too close or leave his toys lying around near it. He never touches the fire guard and only Mummy and Daddy can add logs to the fire. It’s too dangerous for little Dragons. Be safe be seen – winter mornings and evenings are dark and this makes it more difficult for drivers and cyclists to see you. Wear something white or bright, or even better something florescent or reflective. Don’t play near fires or heaters and make sure you do not leave your toys lying around near them. Never stand on a pond, lake or river if it is frozen – the ice can be very thin and you could easily fall in. When it is icy or snowy don’t walk with your hands in your pockets, walk with your hands out and wear gloves so you can break your fall if you do slip. Ice can easily hide under a light dusting of snow. Just because you don’t see the ice doesn’t mean it’s not there waiting for your unsuspecting footfalls. When wrapping up in big coats, scarves and hats to keep warm - make sure you can still see and hear road traffic and spot any icy patches.